Our Favorite Lesser-Known Historic Buildings in MinneapolisIconic structures like the Foshay Tower and the Stone Arch Bridge get the most attention when we talk about the city’s historic sites, but Minneapolis—like all cities—is filled with other notable historic structures hiding in plain sight. The Wells Fargo Branch Bank in North Minneapolis (615 Seventh Street North), nominated by Amy Van Gessell. This building was designed by Sanders Ackerburg. The building itself was sited there after Wells Fargo wanted to distance itself from its previous location near the riots of the late 1960s. It was built in 1969 which followed our grad school assignment to attempt to find significance in more modern buildings. It's a fun building that started my interest in preserving the modern movement. Tiled in scarlet, ivory, and black, this beautiful Art Deco interior feels both timeless and out of time. Tucked behind the quiet lingerie department, it's out of the way of busier customer traffic. Above each sink of soft aquamarine ceramic, floral plaques are mounted, each unique, on which lilies and other flowers float. 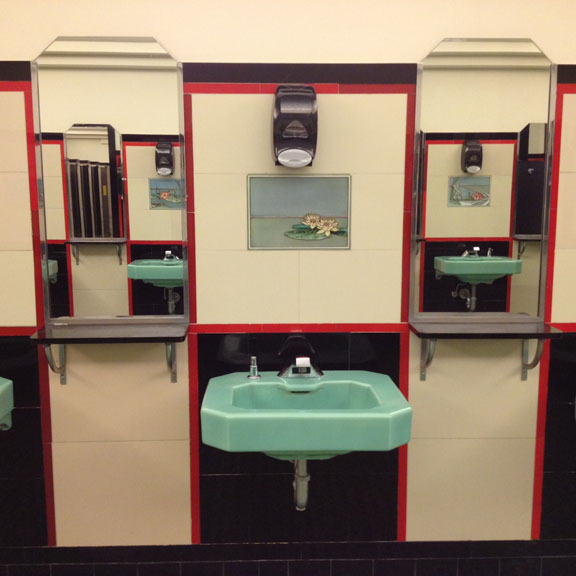 Between these hang mirrors with narrow black shelves, and underfoot, a green tile inlay contributes to the pond theme. "Free Toilet" is etched in Art Deco lettering above the entry to two long banks of stalls. Their black doors have twin vertical metal stripes. A little chipped paint at the bottom of a few of the doors hints that they may have once been a color similar to the bands of scarlet tiling, like a red slip peeking under the hem of a black skirt. I have loved this space for decades, often returning simply to stand and admire. While its essential purpose has been for women's use, it's also specific as a rare and remarkable Art Deco interior. With Macy's tenure on the Nicollet Mall again uncertain, I'm hoping it will continue to evade extinction. The iconic nightclub name is derived from the building's location: the corner of First Avenue and 7th Street in downtown Minneapolis. The building opened in 1937 as a Greyhound bus station. The art deco style building is marked by 531 stars on its exterior along the First Avenue and 7th Street sides commemorating past venue performers. First Avenue and 7th Street Entry is the Twin Cities’ most popular rock and roll venue, and has been influential in nationwide music culture. Many bands and music artists who developed their music art in the Twin Cities include Prince, The Revolution, The Replacements, Hüsker Dü, Soul Asylum, Semisonic, Atmosphere, Brother Ali, Dosh, The Jayhawks, and Curtiss A, among others. 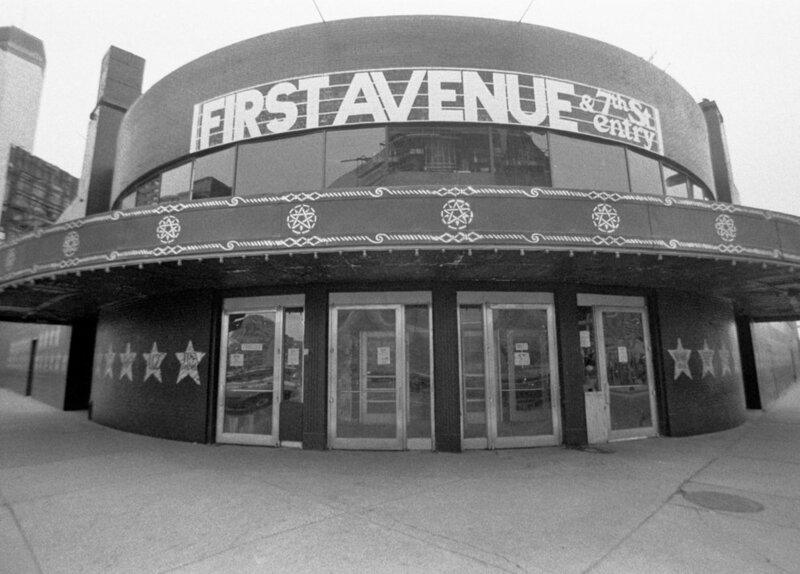 First Avenue appeared in Prince's 1984 film Purple Rain and much of the film's music was performed here. This building, at 125 North 1st Street in the Warehouse District, is kitty-corner from the Bachelor Farmer. It ceased to be a foundry in 1979, at which point it was bought by a software entrepreneur who decided not to renovate it. 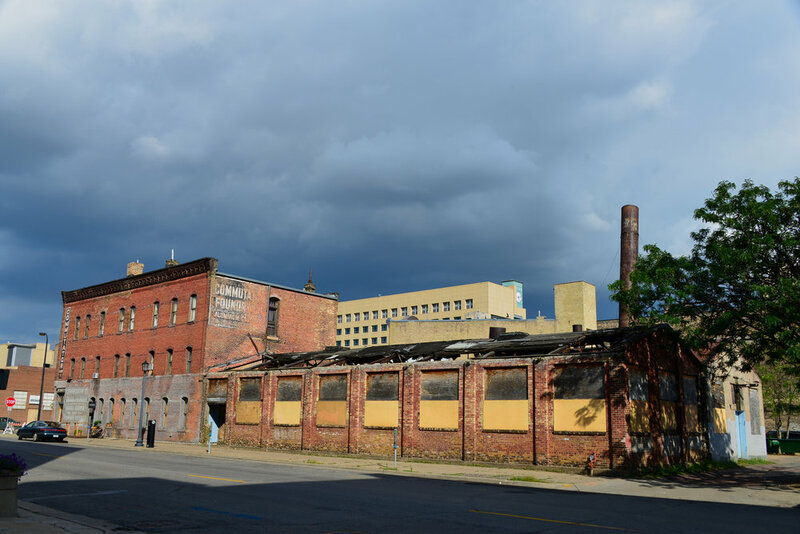 It is now one of a very few unrenovated buildings remaining in the Warehouse District, and the tumbledown rear section is about the only ruin left in that part of town. The most historically noteworthy sites in Lowry Hill East that are not historically designated (locally or nationally) are the R.P. Russell original claim shanty (circa 1854) and the Russell farm house (circa 1860s). R.P. Russell was an original Minneapolis pioneer beginning his legacy at Fort Snelling in the suttler's store, then working in the land survey office. He and his brother Lyman acquired quite a bit of property on the west side of the Mississippi River as well as in St. Anthony in the 1850s.When land became open for 'grabs,' he bought a large parcel in Lowry Hill and south Minneapolis on what is now bordered by Lyndale Avenue South on the east, Lake of the Isles on the west, Lake Street on the south and West 26th Street on the north. This was the R.P. Russell farmstead. To claim the land he built a claim shanty about 1853 and later a farmhouse. In 1873 he built a much more grand home on the corner of Hennepin Avenue and West 28th Street. But he reportedly removed the earlier house and claim shanty to his outlots on the corner of what is now Bryant Avenue South and West 26th Street. The Lippincott House, 252 Bedford Street SE, Minneapolis, was designed by husband and wife architects Elizabeth and Winston Close. Built in 1938 for $7,643 for Ray Faulkner, E. Ziegfeld and G. Hill, the modernist residence is located across the street from Frank Lloyd Wright's Willey House built four years earlier, in 1934.Despite the four-year time separation, each house represents at least a generational difference in the spectrum of Twentieth Century Modernism. The architectural design of Wright’s Willey house obeyed early modernism’s basis of using walls, roofs and window openings for the attributes they were. Four years later the Lippincott House considered these elements as expressing planar systems from which modernism had recently developed and continued throughout Modernism’s continued architectural influence. Thanks to everyone who submitted a building!